November 2010 – Hurley Books – How do you do? We’re very proud to once again announce that E.V. 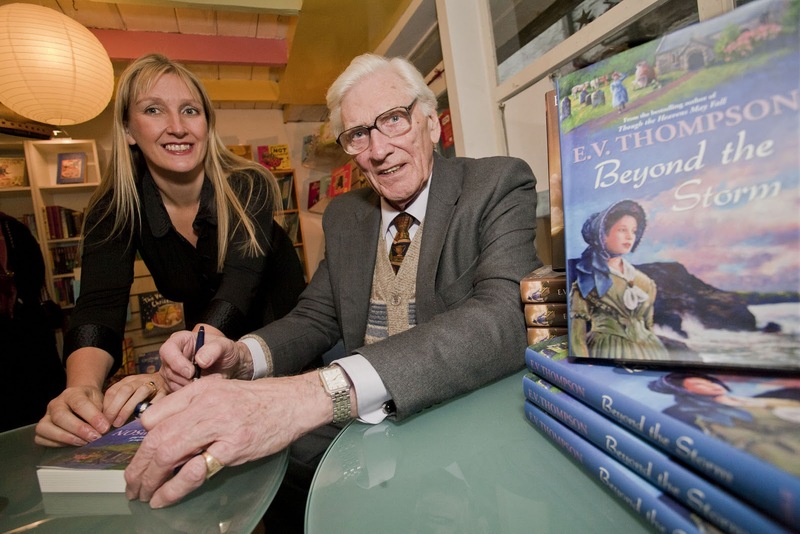 Thompson will be in our Mevagissey shop to sign copies on Saturday 4th of December. When the fiercest storm in living memory pounds the shores of 19th century Cornwall, wrecking ships and bringing death and destruction to seafarers and coastal communities, a young girl is found, barely alive, washed up among the rocks of a remote North Cornish cove. Her arrival and the mystery surrounding her background will affect the lives of those who come to know her and, for Alice Kilpeck in particular, nothing will ever be the same again. On the same day Mevagissey will also be switching on its Christmas Lights, as you no doubt know, the village was hit by the floods but the show must go on and it will, but we would love to have the support of as many people as possible. 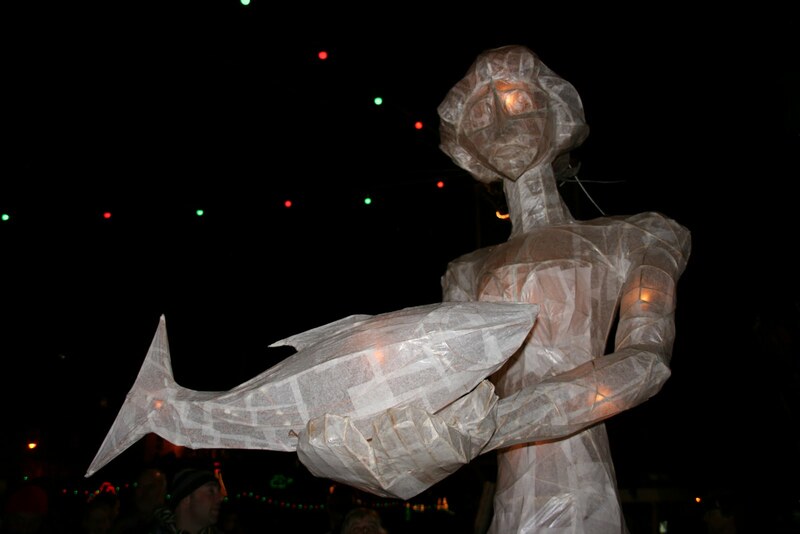 Last year was great fun with music and latern processions, food and drink and this year will be just as good. Get in touch, come along in peron or pre order your copy now. We ran out last year so we’ve ordered more this time but as ever it’s first come first served. 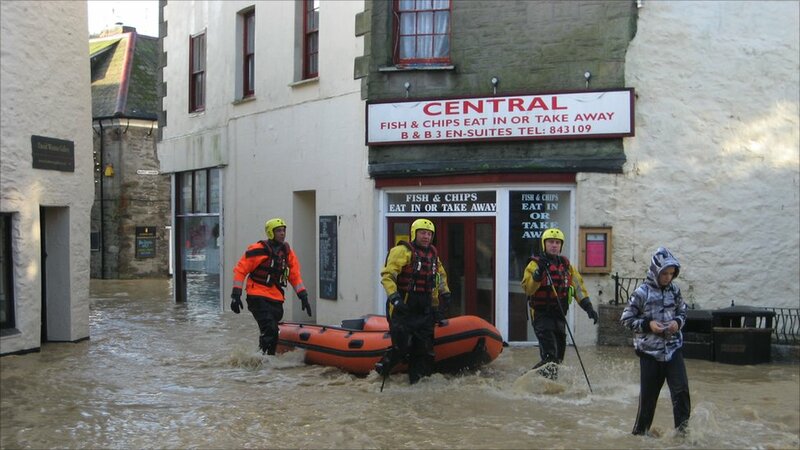 Mevagissey – hard to believe our shop is just around the corner and dry. ﻿ It had been another windy and rainy night but at 6am a car drove past and suddenly it sounded like there had been an explosion. I looked out the window and a car was clearly struggling on the road. This was the first indication that something had happened overnight. I got up to see what had occured and found a blown out manhole cover, the driver obviously hadn’t seen it in the driving rain and flooded road and had gone straight into the hole. Someone from St Austell Brewery came out and put a cone out and later moved it back over the whole. I switched on the radio to see if the rain had affected anyone else to discover reports of landslides, helicopter rescues, front doors blown off, car floating in roads and all happeneing right on my doorstep. You listen to things like this in horror and fascination as you stand in your dry house wondering how it could be so bad just half a mile away in all directions. Of course as the reports came in on Radio Cornwall I began to realise that whilst the house was dry the warehouse was right in the middle of the affected area, at the bottom of a hill, by a river. Books and water just don’t mix so Steve got in the car to see how close he could get and see if we still had a business. He had to park on the bypass and walk down to the warehouse and described a road that was a river and flooded areas everywhere but not in our section of the St Austell Bay Business Park. Whilst he was walking in I suddenly realised that Mevagissey where the shop is might also be in trouble. 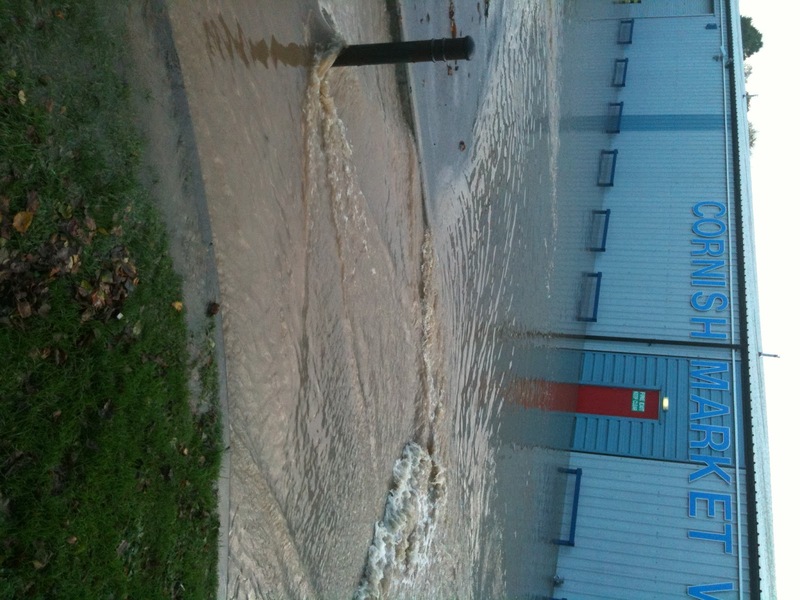 I called Mum who said all of Mevaggisey around Fore Street was flooded and the storm drain was like a cauldron. 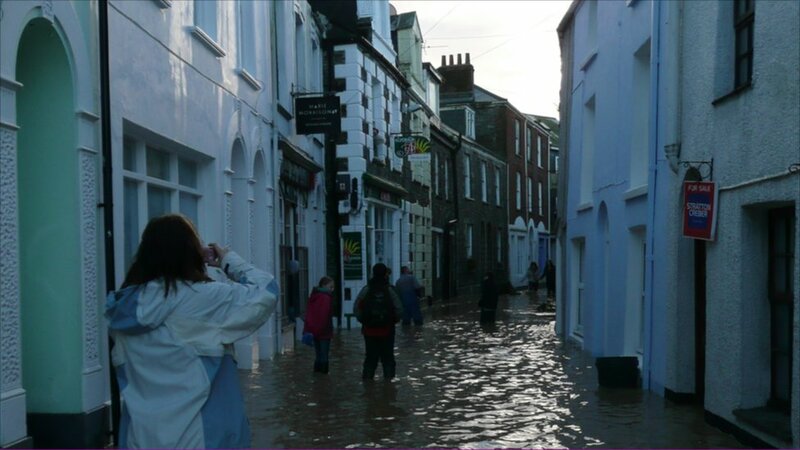 Jetty Street is one of the highest in the village despite being right by the water front so the shop was dry. The children’s school is inaccesible so I have two rather happy children here, one mine, one that I take in. Her father is trying to get his son to Truro as the railway line is closed due to landslides. Eldest son has gone into school but I imagine that it will be disrupted services there today. Steve is now walking back for a fry up and we’re keeping an eye on Mevagissey; the news reports that Mevagissey is completely closed off at the moment and Mum says the water levels are continuing to rise as the flood waters from St Austell flow down. High tide is at lunch but if it stays dry hopefully the worst of it will have drained away before then. All we can do is keep in touch by phone and twitter and thank god that no one was hurt. Incredible videos of Lostwithiel taken by Matt Connolley. Thank god this happened at night when no one was on the roads. Boot Camp – the results. Well I said I’d let you know how I’m doing at Boot Camp and I have to say that I’m still alive and so are my family and I’m lighter and slimmer but it hasn’t been easy. This is my diary. End of Week One and I could only praise the powers that be that not only am I still alive but so too is my family. Giving up coffee was not funny. As an early riser the morning starts haven’t been too horrific, not good but not “kill me now”, that was reserved for the food plan. In all fairness the food sheet is very sensible, lots of fish, meat, fruits, vegs, nuts and water all very balanced, all very sensible but really who enjoys sensible? The idea was that on my non contact days with Petra I would do more exercise on my own via some sheets and videos that she has sent out. I have to be honest I haven’t done them yet. Day One and two I was too tired from getting up at a silly time, day 3 and 4 my head really hurt by day 5 and 6 my energy levels were failing and my kidneys hurt and I was hugely fed up. Every time Petra asked for a smile all she got was a grimace with bared teeth. End of Week Two. This week I’ve woken up feeling better no headache no aching kidneys, finally drinking enough water. Can’t stand the stuff but my previous liquid intake was provided by alcohol and caffeine. So I will do the interim exercises next week and hopefully see more benefits, so far lost 5 lbs and inches all over the place. I know that next week is unlikely to be so spectacular but a loss is a loss. Some really cold mornings. Exercising whilst listening to owls is weird. End of Week Three. More width and weight loss which made me feel a bit sparkier. Unfortunately it was half term so still no additional workouts. Also found it harder to stick to the diet sheet when the boys and their friends were around and there were loads of treats lying about. God help me at Christmas I have no willpower. Feeling bright all week and finding the early mornings easy. Width loss but no weight loss. Start of Week Four. As I write this I’m in my final week so I won’t be able to give you final figures but the blog will have the final measurements. I’m now feeling brighter and have started on the additional workouts (they’re awful – mad woman keeps saying “Isn’t this fun!” You can almost see her exclamation marks). The clocks going back have also meant fewer exercises by moonlight and owl calls. So after three weeks where am I? Well I’ve lost 7.5 lbs and between 3 and 4 inches at all vital points, that’s a loss of 26.5 inches overall so far. So in terms of weight loss it’s not dramatic, in terms of a better figure and a healthier body then I’m pleased with it. Will I do this next month? You bet! This has been a really enjoyable way to get ready for all the Christmas parties. The crowd I train with are incredible friendly and supportive, men and women of all ages, sizes and fitness levels. I haven’t met the evening team but I bet they’re just as nice. Petra doesn’t let you slack and at your private weekly measurement sessions she’s really supportive. There’s also loads of great recipes on her website. Although lets be honest there’s only so much that you can do with pumpkin! I am still seriously missing the coffee though! Frost in October! Who’s have thought it? And not once but twice; this week has been mad for weather. We were at Eden last night and it was so mild that we were walking around in t-shirts, two days earlier I was doing sit-ups on white grass. At least it means that the sloes have actually had a chance to freeze this year prior to me picking them. I make sloe vodka each year and have always had to put the berries in the freezer for a bit. This year I’m also going to try to mash the berries after they’ve been in the vodka for a month and take the flesh and add it to melted chocolate to make flavoured chocolate bars. Might work might be disgusting. I’ll let you know. Of course the first frost reminds me that we’re heading towards a bit of a hibernation time for us in the business. The shop has now reduced it’s opening hours and days and we may seem sleepy but things are all go at Hurley Books. The warehouse is now in full swing and we’d love it if you wanted to pop in and visit, we’re on the St Austell Bay Business Park opposite Market World. 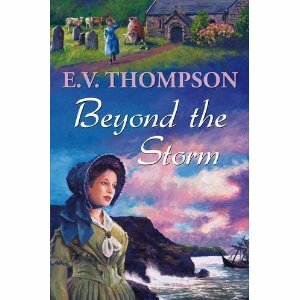 We’re getting ready for the launch of EV Thompson’s new hardback “Beyond the Storm” and I’m working hammer and tongs ready to launch a new business that you are going to love. In fact I’m working on two new businesses, the second will get launched around June, this one will come out around December / January, I’m really excited about both and I can’t wait to tell you more about it but I think that’s a fortnight away. At the moment I feel like a swan that’s gliding around on top seemingly doing not much whilst underneath I’m franticly trying to entertain the children going surfing, skating, walking and playing rugby, do the quarterly accounts and the VAT returns, keep the house clean, prepare a massive database for integration into a brand new website and arrange a signing session at the shop for the new EV Thompson book. Dec 4th 2.30 since you asked.. Oh and sit ups in the frost at 6.15 in the morning. I love having the boys home at half term but I’ll be very glad when I can get back to work proper, next week. How on earth do single parents cope? I have such respect for mothers or fathers that have to run a house, a business and a family all on their own. Incidentally the Eden skate and scream was really good fun and the terror walk might have been more atmospheric if I had left 4 exited boys at the doorway. They found the whole thing highly entertaining, kept trying to “high five” the monsters and ghouls and trying to get attacked by the water snakes. A lot of it was definitely bravado though, and while I despaired of them doing anything quietly I rounded a corner in the Mediterranean biome to find all four boys sat cross legged still as dormice listening to a story teller telling a spooky tale. The scariest part for me was being on the ice, watching the two youngest trying to race when one of them had never been on ice before and trying to avoid their blades as they went down time after time after time. So that’s been my half term, I’ve had great fun, haven’t done half of what I needed to and now need a rest! Boys that go bump in the night. Well it’s time for things to go bump in the night again. I love this festival and we always made a big thing of it when we were little. Coming from a Catholic background we were far more in touch with the concept of Satan and all his minions coming out for the night until the midnight bell rang summoning all the souls back below and coming from an Irish family the witches and little folk were also running amok. When I was little Mum took us to see Disney’s Fantasia and they played Night on a Bare Mountain. Wow – there was my Hallowe’en up on the silver screen exactly as I imagined it every year, it was thrilling and terrifying at the same time. Beyond all the religious and historical significance which of course stretch back past Christianity to Samhain there was also the fun side of things; nothing was so thrilling as walking down a long dark unlit tree lined drive to knock on a strangers door and call trick or treat. Then home to eat a plate of fried brains and human guts. Great fun. There are those who claim that trick or treat is a modern Americanism, not a bit of it. It’s a very old European tradition way back into the 14th century and probably before. After all life was truly scary back then, so sometimes it was nice to make fun of it and of course we were all far more religious back then as well as being more in tune with the changing seasons. It bothers me to see children and teens abusing it by being rude or intimidating but it bothers me just as much when adults are rude and aggressive to those who call at the door. It’s an opportunity for communities and neighbours and different generations to all meet each other on a fun occasion. One of the mothers on my road goes and “prebooks” all her childrens visits, she asks if the neighbours are happy to be called on and leaves treats for them to hand to her children when they knock on the door. How thoughtful is that? And it doesn’t have to be complicated or expensive. Last year our eldest son went off to an arranged party leaving a disgruntled little brother behind. 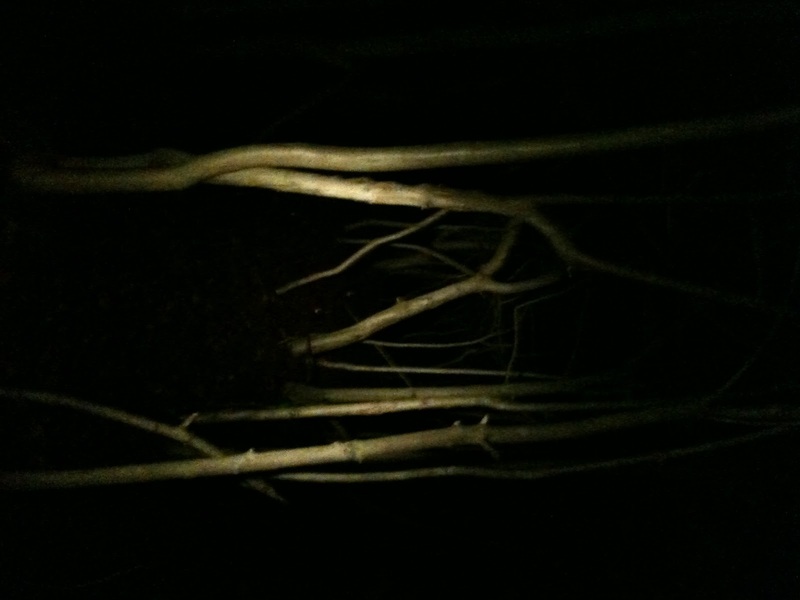 So armed with only a torch the rest of us got into the car and drove to the Kings Wood. Thankfully it’s a walk we do often so despite the dark we didn’t get lost. It was really good fun, strange noises would rustle in the dark, odd animal cries called out through the dark, every so often Steve would disappear with a scream as something gruesome dragged him off the path and from time to time our torch would “fail” and we’d have to walk in bible black darkness. It was the perfect sort of terror, lots of giggles, some nervous, some screams and then hot chocolate and marshmallows when we got home. This year we’re going to go to the scream and skate at Eden but I bet we manage to fit in another night time fright walk, well we have to the eldest insists! I had a lovely walk into the shop this morning. I often park out on the harbour wall and walk in, it gives me time just to enjoy the peace and silence. It was a gorgeous, sunny day with hardly any breeze but there must be quite a swell out in the Atlantic somewhere because the waves would suddenly surge up and slap against the wall followed by a small shower of water on the road. Looking over the harbour it looks like the old lifeboat place is nearly finished. Those flats are going to have stunning views but the windows look a bit stingy and it’s a shame the final finish is so, well, dull. It’s some sort of stone or brick that doesn’t look like any other building over on that side. What was wrong with render painted in a nice bright colour? Or slate hung? Or wildly modern with loads of glass? Still if anyone wants to offer me one, I’d not turn it down. As I came around the harbour wall the fishermen were all shouting back and forth sorting out nets and catching up on the news. One bloke seeing an old mate shouted out Hey Bob, thought you’d died! Bob turned round and said Nah, too busy for that! I have always thought that October is a gift to the residents of Cornwall. The sea is warm and when it’s sunny the air is still warm enough to go and laze on an empty beach. The roads are clear again and we can amble to our destination, not tear and race and vent our frustrations on all and sundry. There are still lots of visitors around but they seem to have fallen into the same relaxed pace that we’re all feeling and as there are visitors here those of us who rely on the tourist trade aren’t yet panicking. The heady days of August when the till didn’t stop ringing are behind us but there’s still money coming in, it’s not as much but it will do. The weather has also been glorious as it so often is in October and I’ve been discovering some lovely new walks, there’s a great one along the river at Lerryn and another fabulous one heading from Melinsey Mill to Pendower Beach. The countryside is rich with pickings right now and I found a wonderful clump of penny buns the other day – very tasty mushrooms and I’m having them with rabbit tonight (thanks Dave!). The sloes are fattening up nicely so that will be Sloe Vodka for Christmas and I’m eyeing up the local geese which are also fattening up nicely. For families the ordeal of September is now passed, the children have finally worked out where double ICT is have finally accepted that homework is a necessary evil. 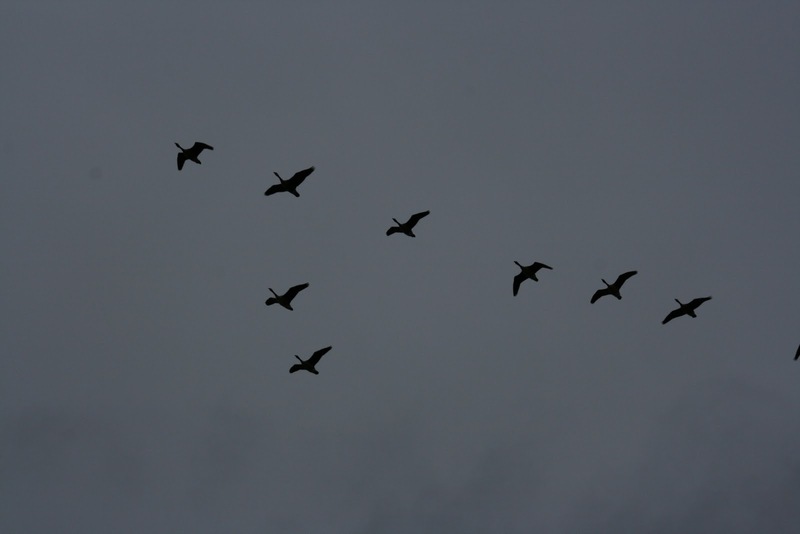 The school run has settled down and everyone knows where they are to be picked up, dropped off, who has what bags and what homework has to be handed in the following day. And of course October always ends with parties, Halloween and Guy Fawkes Night (I know not strictly October – but October’s an embracing month, so the more the merrier). It’s a great opportunity to stand all wrapped up against the elements and look up at the stars, the fireworks and the odd passing witch. So I love October, the start of log fires, warm days and chilly nights, red leaves, quiet beaches and a sense of calm and relaxation. I hope you’re all having an equally good month.